Princess Iron Fan (simplified Chinese: 铁扇公主; traditional Chinese: 鐵扇公主; pinyin: Tiě shàn gōngzhǔ), is the first Chinese animated feature film. The film is based on an episode of the novel Journey to the West. It was directed in Shanghai under difficult conditions in the thick of World War II by Wan Guchan and Wan Laiming (the Wan brothers) and was released on January 1, 1941. The story was liberally adapted from a short sequence in the popular Chinese novel Journey to the West. Princess Iron Fan is a main character. Specifically, the film focused on the duel between the Monkey King and a vengeful princess, whose fan is desperately needed to quench the flames that surround a peasant village. The Wan family twins Wan Laiming and Wan Guchan with their brothers Wan Chaochen and Wan Dihuan were the first animators in China. After the release of their first "real" cartoon, Uproar in the Studio (1926), they continued to dominate China's animation industry for the next several decades. In the late 1930s, with Shanghai under Japanese occupation, they began work on China's first feature-length animated film. In 1939 the Wan brothers saw Snow White and the Seven Dwarfs and set the standard in attempting to create a film of equal quality for the nation's honor. The film took three years, 237 artists and 350,000 yuan to make. Although the Disney influence is apparent in much of the animation, there is also a distinct Chinese flavor in the film[clarification needed] - a flavor that would grow much stronger with the Wan brothers' subsequent films in the following decades. Rotoscoping was used extensively to save money, and the eyes of the live actors are often visible in the faces of the animated characters. By 1940 the film would render past 20,000 frames, using up more than 200 thousand pieces of paper (400ream＝500×400). They shot over 18,000 ft (5,500 m) of footage. And the final piece would contain 7,600 ft (2,300 m) of footage which can be shown in 80 minutes. The Wan brothers also invited the following actors and actresses for sound dubbing (白虹),(严月玲),(姜明),(韩兰根),(殷秀岑). At the time they were at the Xinhua Film Company animation department since it was the only remaining production company left during the period of the Japanese occupation. The manager of the company who help financed the film was Zhang Shankun. Princess Iron Fan became the first animated feature film to be made in China and the 12th worldwide (although it is only the 9th that still survives, as the films of Argentina's animation pioneer Quirino Cristiani are thought to be lost). Upon completion the film was screened by the Chinese union film company. Its influences were far-reaching; it was swiftly exported to wartime Japan (in 1942), inspiring the 16-year-old Osamu Tezuka to become a comics artist and prompting the Japanese Navy to commission Japan's own first feature-length animated film, 1945's Momotaro's Divine Sea Warriors (the earlier film Momotaro's Sea Eagles is three minutes shy of being feature-length). ^ Du, Daisy Yan (2012). 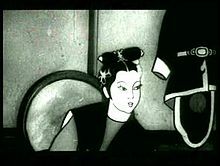 "A Wartime Romance: Princess Iron Fan and the Chinese Connection in Early Japanese Animation," in On the Move: The Trans/national Animated Film in 1940s-1970s China, University of Wisconsin-Madison, 2012. University of Wisconsin-Madison. Jonathan Clements. (2002). "Chinese Animation". Nickelodeon Magazine. Travel Channel China. (2004). "Extensive Info on Wan Brothers". Tieshangongzhu first-length cartoon. Daisy Yan Du. (2012). "A Wartime Romance: Princess Iron Fan and the Chinese Connection in Early Japanese Animation," in On the Move: The Trans/national Animated Film in 1940s-1970s China. University of Wisconsin-Madison, 15-60.